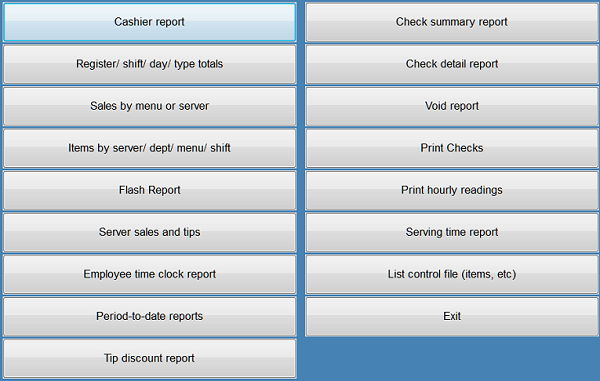 To print reports from the Table Selection screen, go to Main Menu then Print Reports. To print reports from the Item Entry screen, go to Options, then Exit Check, then Print Reports. 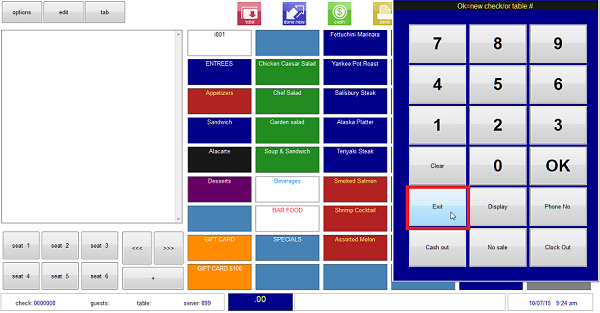 From the "Ok=new check or table #" keypad you can tap Exit then Print Reports. If you are logged on as a Supervisor or Administrator the Supervisor menu will open. Select Print Reports. This guide will provide an overview of the available reports in Execu/Touch Point of Sale but you should familiarize yourself with them by printing all reports that you think will apply to you. Then you can decide which ones best suit your purposes. All of the reports can be previewed (printed to screen). To print reports from the Table Selection screen, go to "Main Menu" then select "Print Reports". 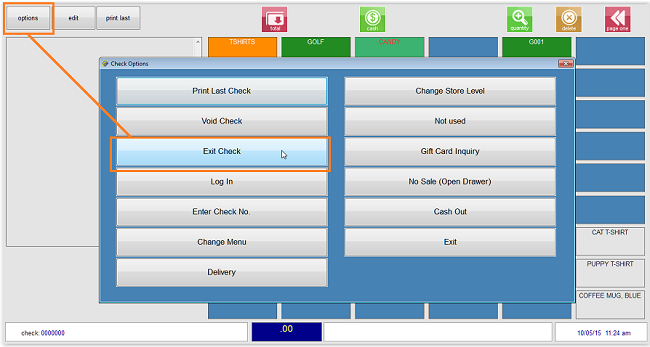 To print reports from the Item Entry screen, go to "Options", then "Exit Check", then "Print Reports". Select the report you wish to print. Below are some of the prompts you will see, depending on which report you are printing. These are not itemized in this guide for each report. When you see a keyboard prompt or a keypad prompt, make sure to look at the top of the on-screen keyboard or keypad to see what information you are prompted for. All of the prompts will not display for all reports and they may not display in the order shown. Also some menus may display. Select the menu option applicable to your report. Menu prompts - touch or click the item to select. 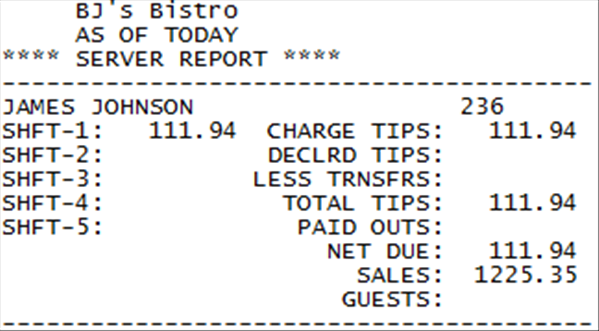 This is a menu for the "register/shift/day/type totals" report. This is the "Sales by menu or server" menu. This is the "items by server/dept/menu/shift menu". This is the "List control file (items, etc.) menu. We advise selecting a laser or report printer rather than your receipt printer. Touch or Click the response on the on-board keyboard and touch or click OK. You also can use your computer's keyboard (CAPS LOCK ON) and press Enter when finished. This is the "Pay type" prompt. Enter the payment code or OK for all. 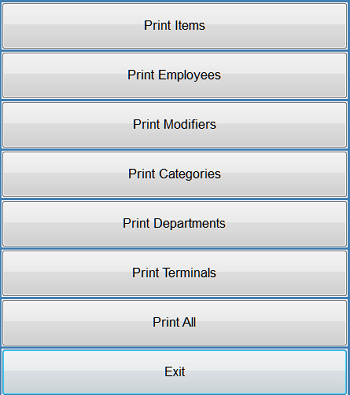 You may enter a category to print or select OK to print all categories. Keypad prompts - Touch or click the appropriate response and then OK. You also may use your computer's keyboard and press Enter. If you are printing a date range report you will be prompted for beginning and ending date. Enter in this format: MMDDYY. Enter the 3-digit Cashier number which may or may not be the Server number. Enter the printer unit number, 0 through 24, to select the printer for this report. See Printer Setup If you have a defined report printer (see Terminal Records ) it will print to that printer by default. You can print to screen. Do not change anything in the Printer Setup without consulting your IT manager. 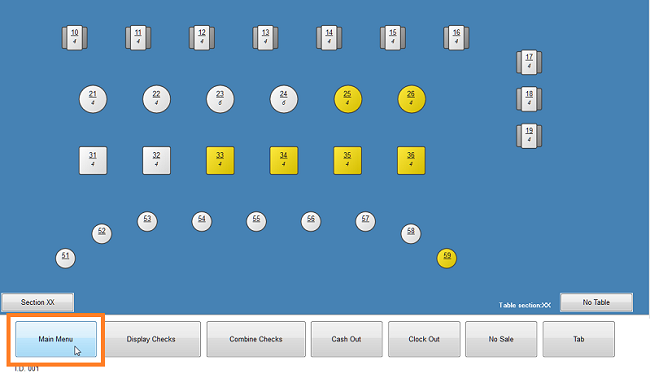 The Register totals report will prompt for first and ending terminal numbers. The Register totals will prompt for the Register to print. 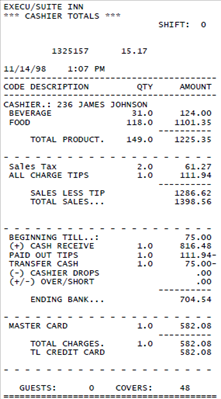 Cashier Report prints the totals for a selected cashier or all cashiers and grand totals. This report should be printed at shift end by each cashier. It also prints when End of Day Close is run. 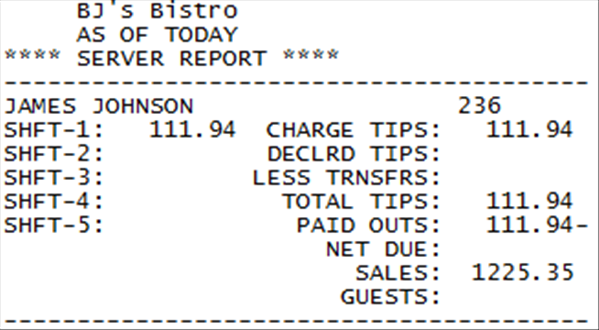 Register/ shift/ day/ type totals prints totals for each register or shift and cashier totals. This shift report is useful if checks are closed at more than one terminal or if there is not a designated cashier terminal. 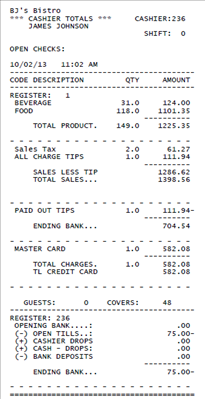 Server sales and tips shows sales and tips entered for each server. This is not a cashier report, which prints the cashier closing the checks. This report shows the server. 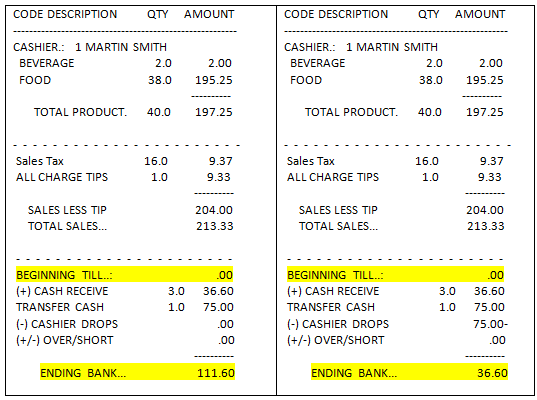 This report is for F&B, not retail. 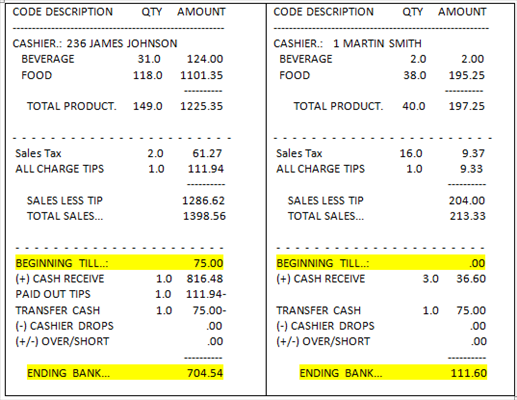 Check summary report shows each check and the summary (sales, tips, discounts, payment). Check detail report shows detail of each check. Void report shows voids and optionally deletes. Print Checks will print checks when the check number is entered. Both open and closed checks can be printed as well as checks from history. The following are Cash Management reports. 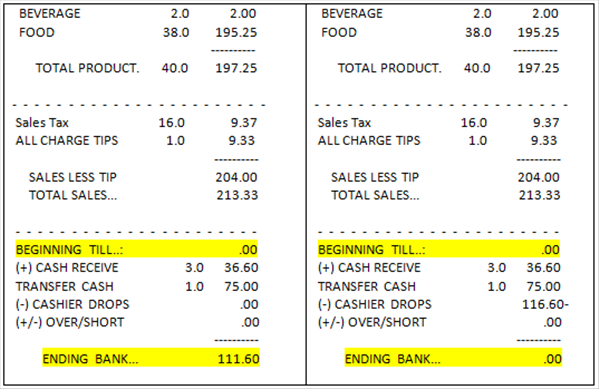 See Cash Management for explanation and setup. Most properties do not use this feature.